Simple ABAP code to demonstrate how to manipulate a logical database selection screen which is assigned and setup within menu option Goto->properties. 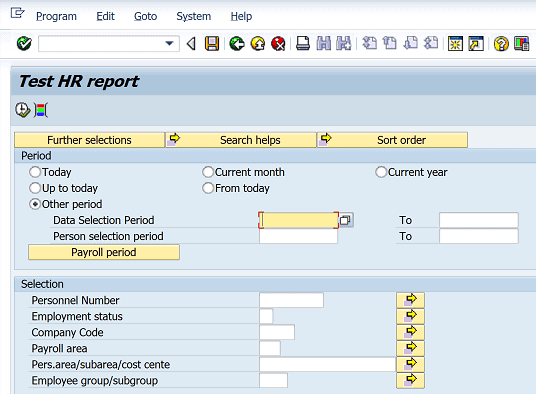 Use of HR logical database selection screen with standard ABAP report. 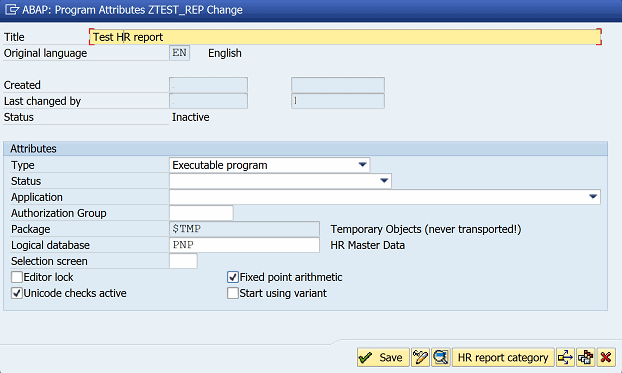 Set default time period/key date for HR logical database report. Set other defaults for HR logical database selection fields. Get SAP HR org structure based on user selection from the tree structure. *& Simple ABAP code to demonstrate how to manipulate a logical database selection screen. SELECTION-SCREEN BEGIN OF block block_qual WITH FRAME title text-002. p_none type c as CHECKBOX DEFAULT ' '. SELECTION-SCREEN END OF block block_qual. data: r_objid type range of hrp1001-objid. data: wa_objid like line of r_objid. wa_pnpobjid like line of pnpobjid. if p_full is INITIAL and p_none is INITIAL. message E003(zp) with 'Please select at least 1 option'. loop at pnpobjid into wa_pnpobjid. read table it_dept into  wa_objtab with key objid = ld_orgeh. LOOP AT objec_tab INTO wa_objtab WHERE otype EQ 'O'. See other example ABAP Reports/Programs..